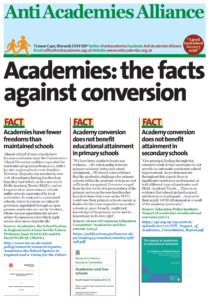 Aldridge Foundation academies have been in the news. In the last few months the head of one of their academies has been suspended and forced out alongside reports of poor inspection grades and financial problems. Parents and staff in Darwen had some knowledge of the Aldridge Foundation since it already ran another school in the town – the Darwen Aldridge Community Academy (DACA). 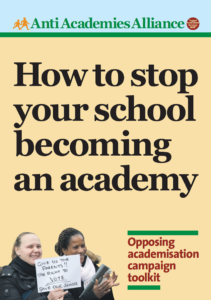 Coincidentally, this academy had been rumoured to have had a part in the resignation of Aldridge Foundation’s founder, Rod Aldridge, as Chairman of Capita in 2006 after it was revealed that he had secretly lent the Labour Party £1 million. Capita was adamant that he had not been pressured to leave but reports, at the time, suggested several shareholders were growing increasingly concerned over Aldridge’s £2m donation to Tony Blair’s academies and his appointment, two months after the loan was made – to head a £150m youth volunteering network in late 2005. In 2006, The Daily Telegraph reported that with Aldridge as Chair, Capita secured £2.6bn of business between 1997, when Labour came to power, and 2006. This included contracts to privatise IT for the Department of Work and Pensions and the Independent Police Complaints Commission and the administration of driving licences. Capita secured a £120m deal to work on behalf of the Department for Trade & Industry over injury claims from coal miners and a contract for the British Waterways’ pension scheme. But Capita’s privatisation was not without criticism. The cost of their work for the Criminal Records Bureau mushroomed from £250m to £400m. Capita was fined £3.7m following problems with the launch of London’s congestion charge and £300,000 for inadequate internal fraud controls. But despite these criticisms The Guardian could report in 2010 that Capita had made Rod Aldridge a fortune worth £110m. Prior to his time with Capita, Rod Aldridge spent time working in local government, including for Brighton Borough Council, and his Foundation’s second and third academies opened in Brighton in 2010 and 2011. The Foundation’s second academy (and first in Brighton) – the Brighton Aldridge Community Academy (BACA) – was created when the city council handed a local authority school – Falmer High School – to the Foundation. As was to be the case with Darwen Vale some years later, the school was already improving. Ofsted’s last inspection visit to Falmer High School in early 2010 commented: “Learning and progress are good, even though teaching is satisfactory, because of the wide range of very well-targeted and focused interventions geared to the needs of the individual. … Teaching in English and mathematics is strong. The curriculum has strengths in meeting the needs of students and is well matched to their capabilities…. the headteacher and senior leaders have robust means in place to improve the quality of teaching underpinned by strong self-evaluation and staff development programmes. All these factors indicate that the school is well placed to sustain its improvement in 2010.” Nevertheless the school was handed to the Aldridge Foundation. Even before the BACA opened there were reports of possible industrial action over threatened cuts in school support staff and rumours of a management team with combined annual salaries of approximately £1 million. When the academy opened in 2010, the BBC reported that more than one third of teachers at the predecessor school had not been given jobs in the new academy. Teachers had been made to apply for posts in the new academy with, the NUT reported, some staff feeling they had been forced out. The result was a far higher number of staff changes than in comparable academies. More than a year after BACA opened, the local paper – The Argus – reported that a third of classrooms remained unused and the academy was 33% undersubscribed with 60 fewer students than the predecessor school had in its final year. And this despite a £26m cash injection to the academy. By 2011, the Aldridge Foundation had been given its second school by the city council despite, once again, Ofsted finding signs of improvement. This was the Portslade Aldridge Community Academy (PACA). PACA’s first head was the head of BACA’s predecessor school, passed over for the post of BACA head by the Aldridge Foundation. Yet by January 2013, he had been replaced by a new interim Head – James Fox.He was subsequently appointed as the permanent Head. 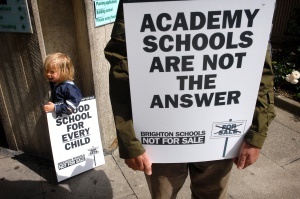 Then in June 2013, with echoes of the culling of staff at the Brighton Aldridge Community Academy (BACA) and Abbeyfield, 26 of PACA’s 66 teachers were made redundant or left the academy. The local NUT described the high turnover of teachers – 44% – as “extremely unusual” and suggested there were “serious issues” at the academy. 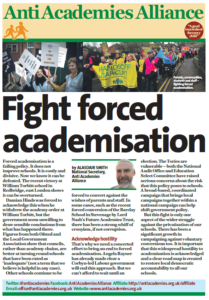 A local councillor, who had been a governor at the school before it became an academy said: “If this is the way the academy is going, they will get no support from me.” Unfortunately, few seemed to take notice that history was repeating itself. In September 2014, less than two years after he’d been appointed, James Fox was suspended as head of PACA pending investigations into the registration of pupils. The principal of Darwen Aldridge Community Academy (DACA) was brought in to support the school. Three months later James Fox left the school by ‘mutual consent’ after it was revealed that students were wrongly registered at the academy – so pushing up overall GCSE results in Department for Education tables in 2012/13. Results were reported as 60%, when they should have been reported as 55.6%. This might be a sad tale of the experience of the Aldridge Foundation in two cities. It’s an expensive story too. Nearly £90m of additional public money was spent on buildings for three of the four Aldridge Foundation academies named in this piece – DACA, BACA and PACA. Any spending on school buildings is to be applauded but academies take a far greater share of capital funding because, we are told, they improve standards. The Aldridge Foundation’s first academy – DACA – has now achieved Oftsed grade 2 (up from grade 3) but both Brighton Academies are doing little better than before. Both were inspected at the end of 2014 and given grade 3s. This was one grade better than the grade given to PACA’s predecessor school – but suggested no improvement on the academy’s previous inspection grade. At BACA the academy continues to be a grade 3 – the same as its predecessor. 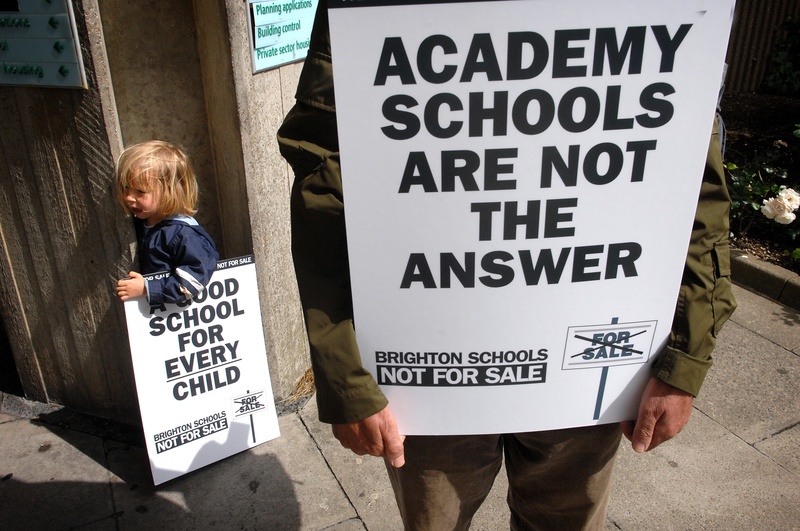 Strangely enough, a week after James Fox’s suspension from PACA a Local Authority neighbouring school, Hove Park School with a grade 2 inspection, decided against conversion to academy status. The City Council had organised a ballot and this time parents and staff were given the right to express their views. They did; they didn’t want an academy. This entry was posted in Academy watch, News, Top story and tagged Aldridge, Sponsors. Bookmark the permalink.